Phyllo, also spelled “fillo”, is notoriously unforgiving to work with. Not only is it incredibly delicate, tearing at the tiniest amount of pressure, but it will dry out faster than you can say “spanakopita” should it be left unwrapped or uncovered. A. It’s not the end of the world if the phyllo dough tears. It happens to me almost every time I work with it. Ninety-nine times out of one-hundred, you are brushing the sheet with butter and covering it with another sheet, likely covering the tear at the same time. See? Problemo solvo! B. Flaky, crispy, buttery baked phyllo layers wrapped around warm fillings still taste as decadent as puff pastry while being much kinder to your waistline. C. Yes, the phyllo dries out quickly. Just make this your mantra: Should I work with phyllo, I promise to keep a damp towel nearby to cover the unused dough. Repeat 10 times. 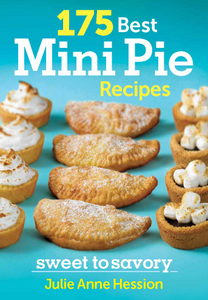 When I was creating recipes for my mini-pie cookbook, I became quite good at working with phyllo, and I found that it is a great alternative to pie crust, especially if you don’t want to make your own (you can make your own phyllo, but as far as I can tell it is a laborious process, so for now I’m sticking with the convenient boxed variety.) 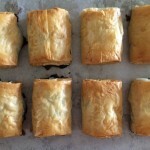 In addition to the aforementioned traditional spanakopita, I included several recipes for sweet and savory phyllo “packets”, similar to individually-sized strudels. Not only are these packets easy to make–you just need your phyllo sheets, melted butter, a pastry brush and your filling–but you can fully assemble them and freeze them for up to one month and then bake them as needed, super-convenient for entertaining or an easy dinner served alongside a salad. 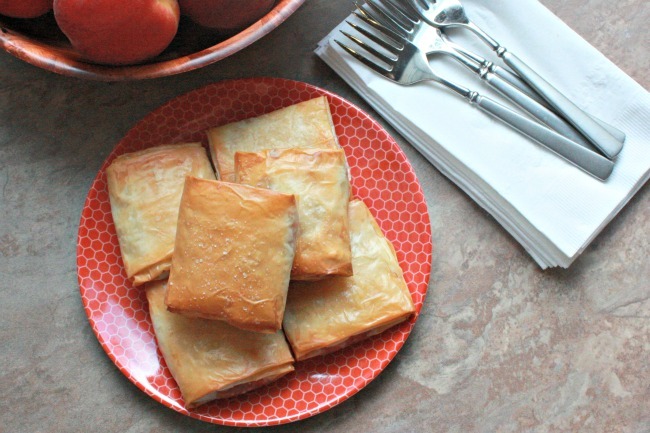 This new variation of my phyllo packets (not featured in my book) was inspired by two things: my using-up-my-Trader-Joe’s-peaches series of posts and my husband’s favorite baked brie appetizer at our most visited local restaurant, Table 34. 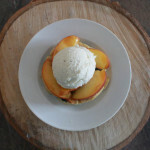 The nice thing about this recipe is that it can be served either as an appetizer, like baked brie, or as a unique twist on dessert since the peach filling is lightly spiced, reminiscent of the filling in a peach pie. Either way, these four-bite treats are hard to resist hot from the oven, when your fork breaks through the crispy phyllo crust, revealing the melted buttery brie and sweet, juicy peaches. Hungry? Me too. I suggest these strudels–you’ll thank me later. 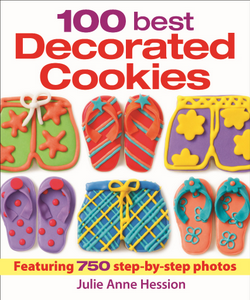 Oh, and be sure to check out the step-by-step photos from my book, posted after the recipe! These sweet and savory phyllo packets were inspired by the popular entertaining appetizer: baked brie. Serve them as a first course or as a unique combination of a cheese course and dessert! In a medium saucepan set over medium heat, bring the peaches, brown sugar, lemon juice, ginger, cinnamon and nutmeg to a boil. Reduce the heat and simmer, stirring occasionally, until peaches have broken down and the mixture has thickened, about 20 minutes. Remove saucepan from the heat and set aside to cool completely. Preheat oven to 350F/180C, placing racks in upper and lower thirds positions. Line 2 baking sheets with parchment paper. Prepare phyllo packets (refer to step by step photos below for additional help! ): Place 1 sheet of phyllo on a clean work surface, short side facing you. Cover remaining sheets with a damp towel to prevent drying. Brush the sheet of phyllo with melted butter, then top it with a second sheet of phyllo. Place about 1-1/2 tbsp (22 mL) of the cooled peach filling on the bottom center of the phyllo, leaving a border at the bottom and the sides. Top the peach filling with about 1 tbsp (15 mL) brie. Carefully fold both sides of phyllo over the filling, so that they meet and overlap, covering the filling completely. Brush the top surface of the phyllo rectangle with melted butter. 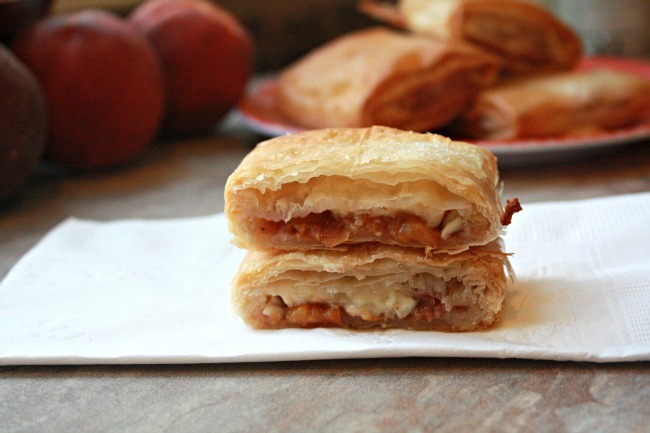 Repeat the process with the remaining sheets of phyllo, peach filling and brie. Bake phyllo packets for about 25 minutes, or until the are crisp and deep golden brown, switching positions of baking sheets halfway through the baking process. Serve warm while the cheese is still ooey-gooey!! I prefer to use salted butter for this recipe to complement the sweet filling, but unsalted butter is a perfectly fine substitute. You can leave the peaches unpeeled to save time -- it doesn't make that much of a difference. The strudels can be fully assembled and frozen for up to one month. Place them in one layer in zip-top freezer bags and freeze. Bake from frozen as directed. 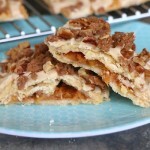 Oh wow, it’s like baked Brie and baklava had a baby. Amazing! I love these little bundles of goodness. 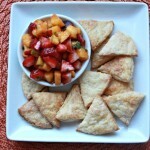 I pack brie in phyllo with lots of things but I haven’t used spiced peaches. I’ll do this next! Thank you, Maureen!! I hope that you enjoy the new combination — let me know what you think!